Notes: HE WAS BORN IN EASTBOURNE AND RESIDED IN BRIGHTON AND FORMERLY SERVED IN THE WEST SURREY REGT. 10/9/44 L/CPL'S CROUCH AND BOYES SHRAPNEL WOUNDS AT T JUNCTION IMMEDIATELY IN FRONT OF COY HQ's PREVIOUS LOCATION, COY BILLET SEVERELY DAMAGED BY SHELLFIRE. 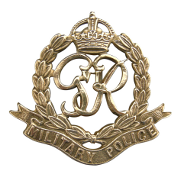 NO TRACE CAN BE FOUND OF L/CPL BOYES MOTOR CYCLE OR THOMPSON SUB MACHINE GUN WHICH DISAPPEARED FROM HIS PLACE OF DUTY WHEN HE WAS SERIOUSLY INJURED AND EVACUATED TO HOSPITAL. 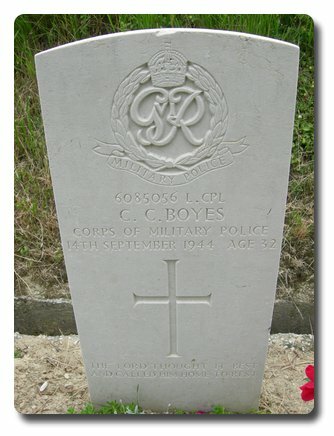 14/9/44 L/CPL BOYES DIED FROM WOUNDS. UNIT WAR DIARY W170/494. INSCRIPTION ON GRAVESTONE: THE LORD THOUGHT IT BEST AND CALLED HIM HOME TO REST.